This antibody detects endogenous levels of total Myc protein. Synthetic peptide corresponding to Human c-Myc. 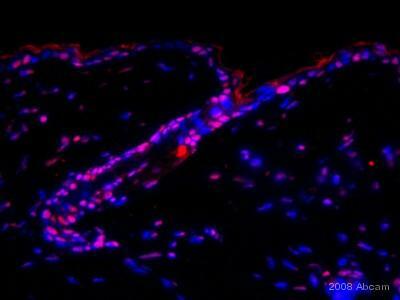 Human breast carcinoma tissue; NIH/3T3 cells. The antibody was affinity purified from rabbit antiserum by affinity chromatography using epitope-specific immunogen. Our Abpromise guarantee covers the use of ab39688 in the following tested applications. WB 1/500 - 1/1000. Detects a band of approximately 49 kDa (predicted molecular weight: 49 kDa). Note=Overexpression of MYC is implicated in the etiology of a variety of hematopoietic tumors. Note=A chromosomal aberration involving MYC may be a cause of a form of B-cell chronic lymphocytic leukemia. Translocation t(8;12)(q24;q22) with BTG1. Defects in MYC are a cause of Burkitt lymphoma (BL) [MIM:113970]. A form of undifferentiated malignant lymphoma commonly manifested as a large osteolytic lesion in the jaw or as an abdominal mass. Note=Chromosomal aberrations involving MYC are usually found in Burkitt lymphoma. Translocations t(8;14), t(8;22) or t(2;8) which juxtapose MYC to one of the heavy or light chain immunoglobulin gene loci. Phosphorylated by PRKDC. Phosphorylation at Thr-58 and Ser-62 by GSK3 is required for ubiquitination and degradation by the proteasome. Ubiquitinated by the SCF(FBXW7) complex when phosphorylated at Thr-58 and Ser-62, leading to its degradation by the proteasome. In the nucleoplasm, ubiquitination is counteracted by USP28, which interacts with isoform 1 of FBXW7 (FBW7alpha), leading to its deubiquitination and preventing degradation. In the nucleolus, however, ubiquitination is not counteracted by USP28, due to the lack of interaction between isoform 4 of FBXW7 (FBW7gamma) and USP28, explaining the selective MYC degradation in the nucleolus. Also polyubiquitinated by the DCX(TRUSS) complex. Nucleus > nucleoplasm. Nucleus > nucleolus. c-Myc is also expressed in the cytoplasm. Western blot analysis of extracts from NIH/3T3 cells treated with EGF, in the absence (lane 1) and presence (lane 2) of synthesized peptide, using ab39688. 5-30µg of cell extracts loaded per lane. 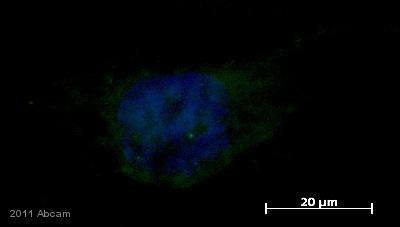 Immunohistochemistry (Formalin/PFA-fixed paraffin-embedded sections) - Anti-c-Myc antibody (ab39688)This image is courtesy of an anonymous abreview. 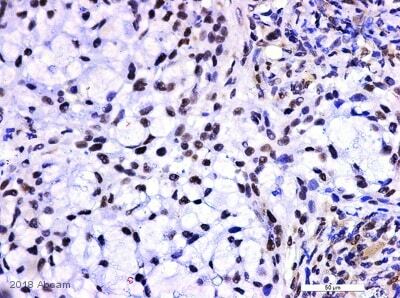 Immunohistochemistry (Formalin/PFA-fixed paraffin-embedded sections) analysis of mouse pancreatic cancer tissue sections labeling c-Myc with ab39688 at 1/50 dilution. Tissue was fixed in paraformaldehyde and permeabilized with TBST. Heat mediated antigen retrieval was performed using a citrate buffer. Tissue was blocked in 10% serum for 1 hour at 20°C. 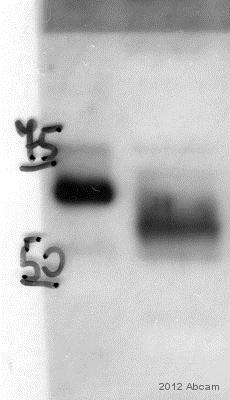 A polyclonal goat anti-rabbit biotin conjugated secondary antibody was used at 1/1000 dilution. ab39688 staining P22 mouse dorsal skin tissue sections by IHC-P. Sections were PFA fixed and subjected to heat mediated antigen retrieval in citrate buffer prior to blocking with 10% serum for 1 hour at RT. The primary antibody was diluted 1/20 and incubated with the sample for 24 hrs at 4°C. A biotinylated goat anti-rabbit antibody was used as the secondary in conjunction with streptavidin-Cy3®. 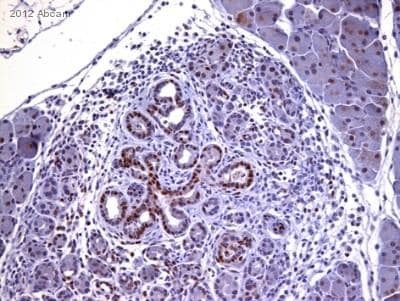 Immunohistochemistry (Formalin/PFA-fixed paraffin-embedded sections) analysis of human pancreatic cancer tissue sections labeling c-Myc with ab39688 at 1/50 dilution. Tissue was fixed in paraformaldehyde and permeabilized with TBST. Heat mediated antigen retrieval was performed using a citrate buffer. Tissue was blocked in 10% serum for 1 hour at 20°C. 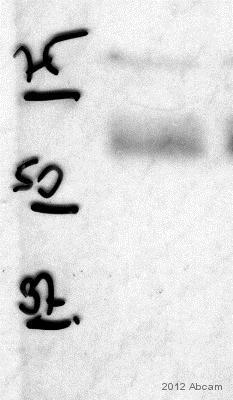 A polyclonal goat anti-rabbit biotin conjugated secondary antibody was used at 1/1000 dilution. 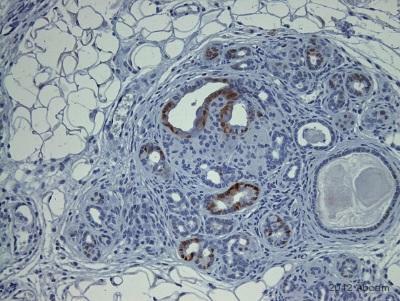 ab39688, at 1/50 dilution, staining Human c-Myc in breast carcinoma tissue in the absence (left) and presence (right) of blocking peptide by Immunohistochemistry, Paraffin embedded tissue. Publishing research using ab39688? Please let us know so that we can cite the reference in this datasheet.